Everytime we have a dimsum lunch we tend to order too much - not that I'm complaining. So we usually have a very light dinner afterwards or none at all. Last Saturday was one like this, me and my husband were still partially full and we couldn't possibly have our usual dinner. I decided to fix something light with the ciabatta I picked up from the supermarket earlier. Bruschetta is a favourite starter in Italian restaurants. In essence, it's garlic bread with toppings like tomatoes or anchovies or aubergines, etc. Although this garlic bread uses olive oil instead of butter. 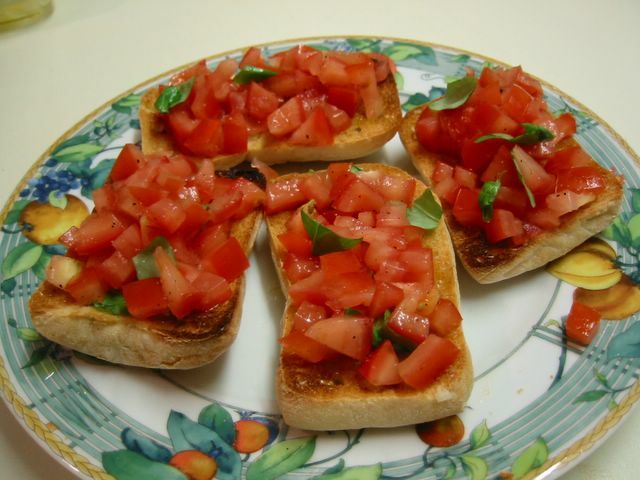 The one I made that night is the standard bruschetta you find in restos with tomatoes and basil leaves on top. Very easy to make though quite refreshing to have. Biting on the combination of crusty garlicky bread soaked in olive oil with fresh tomatoes and basil on top is simply divine. I've done several recipes for caldereta with different takes on this spicy dish. 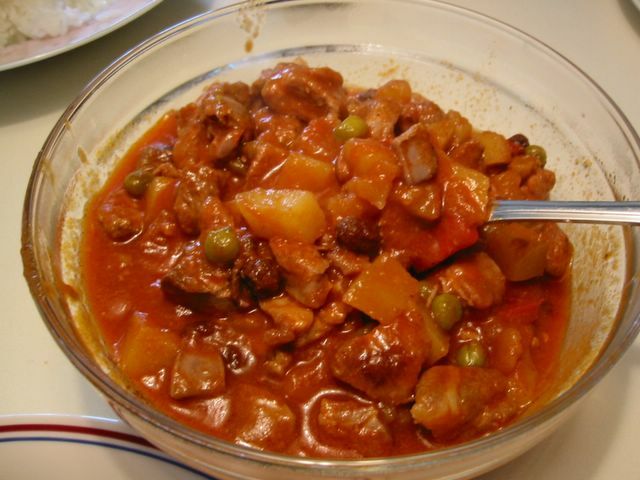 But I always comeback to this version which is the simplified amalgamation of most of the calderetas I have tasted. 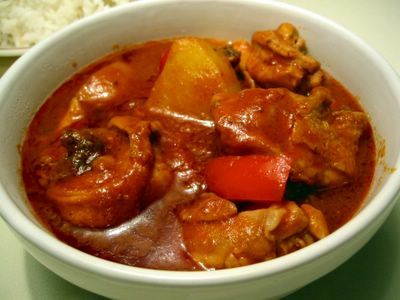 Goat's meat is traditionally used in the Filipino caldereta. The spiciness lends well and sort of masks the 'gamey' taste of the goat's meat and since it's quite tough the dish benefits from the long simmering making the sauce quite rich. Like any popular dish, it's got lots of variations and mine here uses chicken instead of red meat. I tone down the spiciness if I know my children are having it otherwise I add the full gamut of fresh chillies and Tabasco sauce. Also for everyday use I often skip the chorizo and olives. This recipe can be adapted for red meats as well such as goat's meat, mutton, beef, lamb, etc. The only difference that I could think of is that you have to marinate the red meat longer and obviously simmer/cook it for a longer time. Mix vinegar, salt, garlic, and peppercorns in a bowl. Add chicken pieces, mix well. Marinate chicken for at least 2 hours. In a big pot, heat oil for frying. Drain chicken from marinade and brown briefly in the oil in batches. Set aside. Remove oil from the pot but leave about 2 Tbsp. Heat up again and saute the onion on medium heat until soft and translucent (about 4-5 minutes). Scoop out the garlic and peppercorns from the marinade and add to the onion. Saute for a few minutes. Add in the browned chicken, stir for a minute. Add the rest of the marinade, stir and cook for about 30 seconds. Stir in the passata and bell pepper. Bring to boil then turn down the heat. Add the chorizo and fresh chilli (if using). Simmer until meat is almost done. Stir in the liver pate and mix well to combine. Add potatoes and peas. Simmer until potatoes are cooked. Add grated cheese, mix well until cheese has melted. Taste sauce and correct seasonings adding hot chilli sauce if preferred. Add olives just before removing from heat. Serve warm. If you want a sweet dessert for the current hot summer days why not try this staple of Chinese dimsum restaurants. It's basically cold ginatan with sago and fruits. You can vary the fruit, instead of honeydew melon you can use watermelon or rock melon or other fruits you fancy. We had this when we had a barbecue at a friend's house. 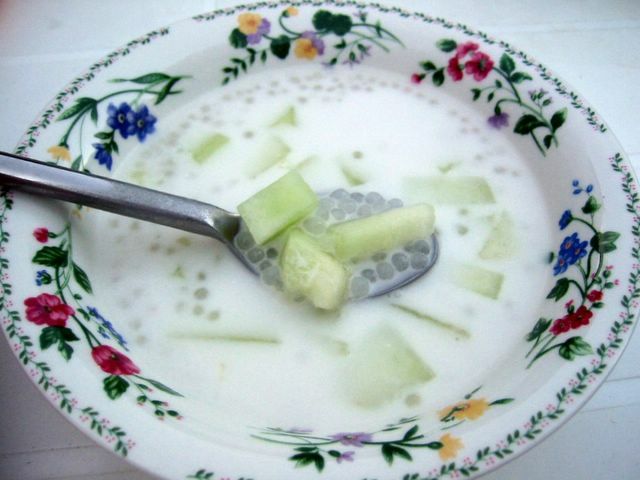 It was so refreshing to have a very cold bowl of coconut soup dotted with floating pearls of sago and the fresh crunchy bite of the honeydew. I got sago cooking tips from Wendy's Eupho Cafe and indeed the sago I made was well cooked through (no white thing in the middle) , soft but a bit chewy and not at all mushy. So thanks Wendy for that tip. This is so easy to make even kids can do it. Boil about 3 cups of water in a saucepan. Add in sago pearls and bring to boil. Once it boils, cover saucepan and turn off heat. Leave for 20 minutes. Remove the lid, stir the mixture, turn on the heat and bring it to boil again. Once it boils the second time, cover again, turn off the heat and leave covered for 10 minutes. The sago should be cooked by now. Drain the sago from the hot water and rinse. Soak in cold water (to stop it cooking further). When completely cool drain again and set aside. Put coconut milk in a saucepan. Add in enough water to dilute it. This will depend on the brand of coconut milk you got. If it's very thick then you add up to 1 cup water. If a bit thin then you reduce the water accordingly. Add sugar and a pinch of salt. Stir to mix and bring to boil for a few minutes until sugar is completely dissolved. Taste the mixture to see if the sweetness is acceptable, if not, add more sugar. Remove from heat and cool completely. Chill in fridge. This should be served very cold. Top with some honeydew melon. Serve. Variation: Add in pandan leaves in the coconut soup mixture before boiling. Remove the pandan after taking coconut soup from heat. For me, after work dinner at home usually consists of some meat stew and steamed vegetables with the occassional rice. Sometimes I hanker for a more 'sophisticated' veg dish and try to whip up something quick. I almost always end up doing a Chinese stir fry because it's so easy to cook in the shortest time possible. But this dish involves braising under cover not just plain stir frying. I love the combination of the ingredients with the simplicity of the sauce it uses. 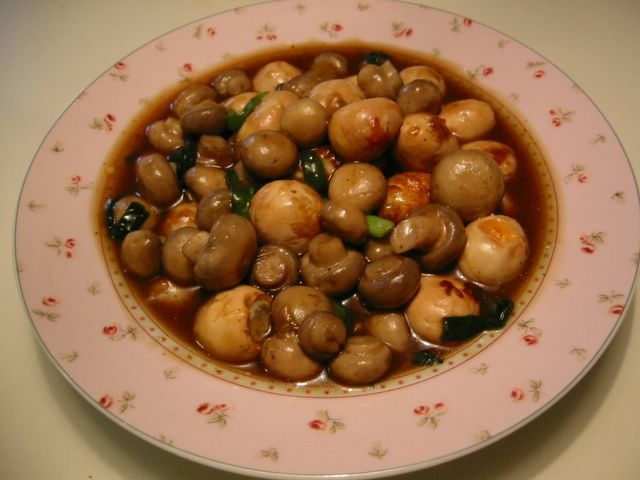 Soak black fungus in warm water for 20 minutes, rinse and drain well. Cut into bite size pieces discarding any hard bits. Mix stock, soy sauce or oyster sauce in a small bowl. Set aside. Heat about 2-3 Tbsp oil in a non-stick pan and fry one small slice of ginger (if using) until it turns brown. Discard ginger then fry bean curds in the same oil in pan until light brown. Drain and set aside. Heat about 2 Tbsp oil in a casserole or medium sized pot. Again fry one small slice of ginger (if using) in the oil until the ginger turns brown. Discard ginger. Stir fry the Chinese leaves in the pot for about 1 minute then add the carrot, mangetout and bean sprouts with the salt and sugar. Cook for about 1 minute. 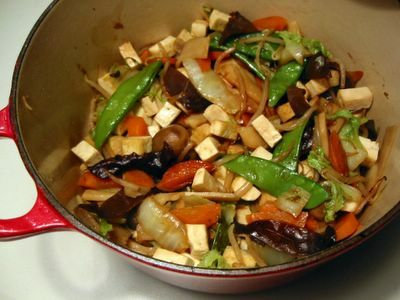 Add the black fungus, bamboo shoots, straw mushrooms, and stock mixture. Blend well and bring to boil. Then reduce heat and cook under cover for 5 minutes. Lift cover and add sesame oil. Stir for a few seconds more and then serve. Note: If you must wait for quite sometime before serving it, do not put the lid tightly on the pot. Keep it slightly ajar to prevent the vegetables from overcooking and discoloring. This is probably the worst food blogging event I've done. Not the theme of course (which by the way is tart), but my entry. I just can't hack this tart making more specifically the tart base. Why my first attempt was a resounding disaster because my tart almost burnt to cinders. The second one almost met the same fate. :sigh: My ancient oven seems to have a lot of hot spots. The biscuit-like base was actually good which should be crunchy and on the brittle side but it got sooo hard when I made the mistake of chilling the whole thing. I was already contemplating on borrowing my neighbor's chainsaw to give myself a slice. Then there's the case of the pastry cream (creme patisserie) which tasted sort of ... ah ... 'cheap'. It must be the vanilla or maybe I should have used single/light cream instead of milk. I don't know, it just doesn't taste right. 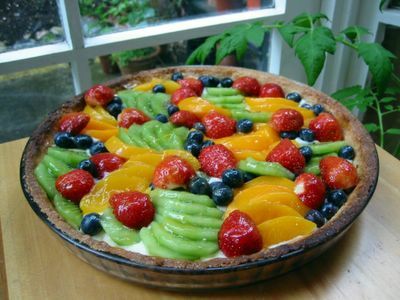 The only consolation I have is the sight of the fresh fruits arranged glistening on top. Really nice. Preheat oven to 200°C/fan 180°C/400°C/gas mark 6. Mix flour and sugar in a bowl. Cut in butter with a pastry blender or two butter knives until they resemble coarse breadcrumbs. In another bowl, gently mix egg yolks and vanilla. Add little by little into the flour mixture while tossing and mixing with a fork. Press and squeeze the mixture into a ball (if needed sprinkle a few tablespoon of water). Wrap in plastic film and refrigerate for 30 minutes. Take the dough from the fridge and roll out into a 13-14 inch circle. Lay out on a 10-inch tart pan and trim the edges. Prick the base all over with fork. Remove beans and parchment paper and bake again for about 7 minutes. Remove from oven and cool completely. Boil milk in a saucepan. While waiting for it to froth over, mix egg yolks, flours, sugar, and vanilla in a heatproof bowl. Once the milk boils, pour into the flour mixture in a thin stream while whisking constantly. Transfer back into the saucepan and let simmer until thick while stirring all the time. 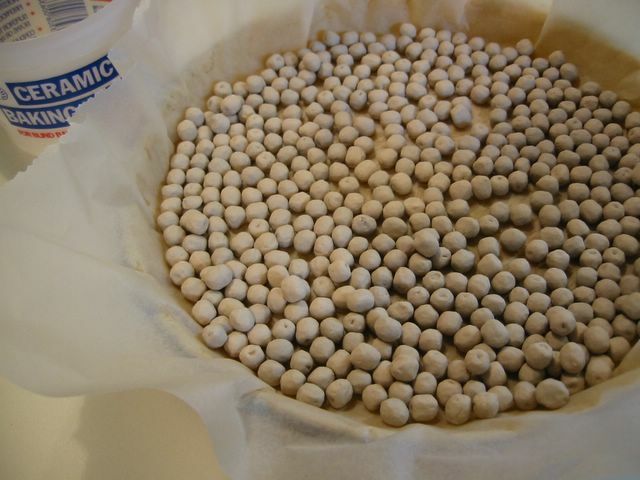 Remove from heat, put a moistened parchment paper on the surface (to prevent a film/crust from forming on top). Cool completely. Heat apricot jam and water in a saucepan. Strain and cool. 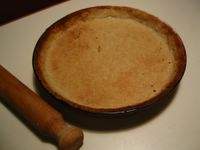 Spread the pastry cream evenly on the tart base. Arrange sliced fresh fruits on top. Brush the apricot jam mixture on the fruits using a pastry brush. Serve. 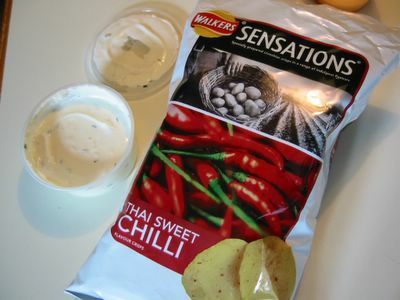 Thai Sweet Chilli crisps from Walkers was already my favourite when it first came out a few years ago. But I discovered that when you paired with a sour cream and chives dip it was out of this world. Labeeeett!! It had the right blend of sweetish very mild spicy hot flavour with the usual excellent crunch of crisps that Walkers does well. Once you dip it in that sour cream concoction the spiciness of the crisps is countered by the bland coolness of the dip that gives an ever so slight sweetness to the combination. Oh, so heavenly ... hmmm, hmmmm, hmmm! I could finish one whole big bag of this in one sitting but only with the sour cream dip. I've always loved contrasts in food. Something about the balancing of flavours and textures appeals to me. How about you? What's your favourite crisps or potato chips combo? Heat olive oil in a heavy bottomed saucepan. Fry pancetta in medium heat until brown. Tip in the garlic and chilli flakes. Stir and cook for about 1 - 2 minutes. Add in chopped tomatoes, tomato puree, and season well with salt and pepper. Bring to boil and simmer for about 15 minutes. Stir in parsley in the sauce and cook for another minute. Taste and adjust salt and pepper if necessary. 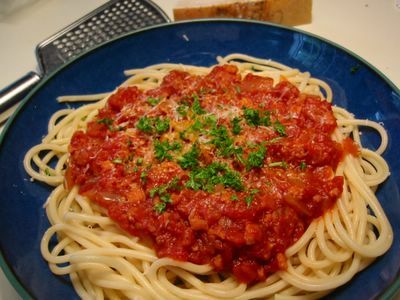 While the sauce is simmering, cook spaghetti in boiling water until 'al dente' (about 11-12 minutes). Drain and set aside. 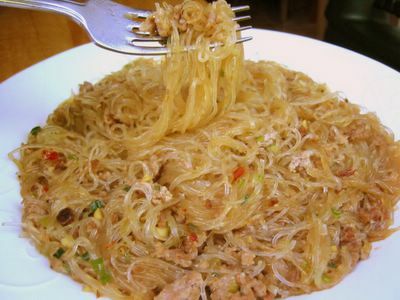 Add cooked spaghetti to the pan and mix until well covered evenly by the sauce. Serve onto serving bowls and sprinkle parmesan cheese on top. Note: You may also serve it with the sauce on top of the pasta as seen in the photo above. Most of my recipes here are 'basic', you know ones that are basis of endless variations depending on availability of ingredients, cook's mood, or customer's (ones who will eat it) preference. That's always been my intention, to record all my basic recipes first then do the variations afterwards. I have a running list in my head of basic recipes I will post here. 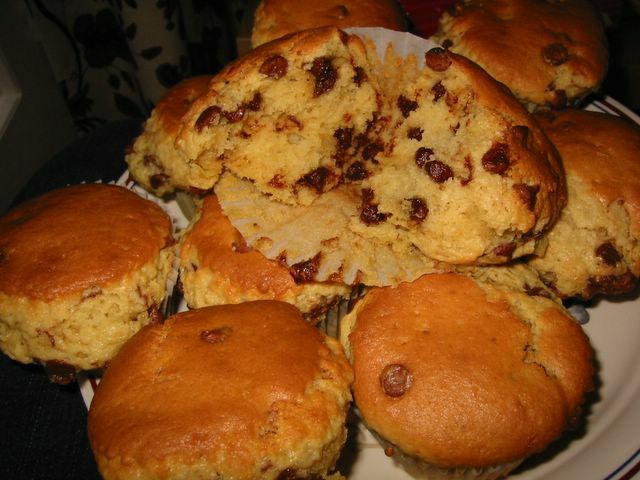 One of them is this chocolate chip muffin. I waited sometime because I was looking for a recipe that would do better than what we sampled over the years. Preheat oven to 190°C/fan 170°C/375°F/gas mark 5. 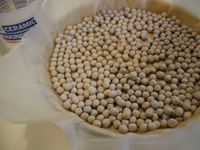 Grease or line a 12-hole muffin pan. Combine flour, baking powder, bicarbonate of soda, and salt in a bowl. Mix well. Combine melted butter and sugar in another bowl. Beat until well combined. Add yoghurt, eggs, and vanilla. Fold butter mixture into the flour mixture. Do not overmix. Put in 10 of 12 muffin pans. Half-fill the remaining 2 with hot water to avoid burning the pan and give moisture while baking. Bake for 20-25 minutes or until metal skewer poked in the middle comes out clean. Do not overbake! Let stand for a few minutes in the pan, turn out and cool on a rack. 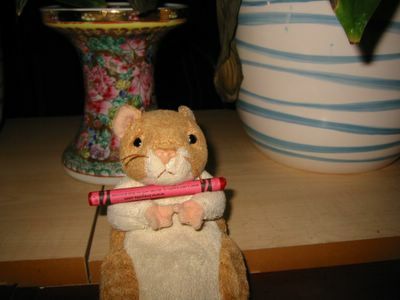 It's been a while since I blogged. Me and my family were on a driving holiday to Switzerland last week and it's only now that I got to sit down and type up something for this food blog. I will be posting our travel iteneraries in my other blog - soon. But on the food front it was not quite as exciting. We just passed by France, stopping at Reims to sleep and tour around for a few hours. I didn't get a chance to visit a local market or eat a restaurant. Three kids were with us who were turning up their noses on things like pig's trotters, sausages or anything that looked different. Ay ya yay!! 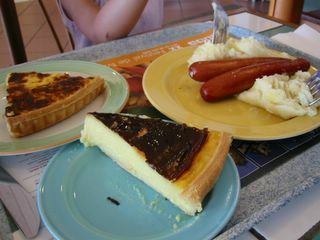 I did notice that roadside food in France is so much better than in the UK. They're expensive as well but we had one of the best quiche, egg flan, and mash potatoes at a roadside cafe in the Jura region. High prices in Switzerland kept me from eating at proper sitdown restaurants which is a shame 'coz Shatzli suggested lots of food to try. I even printed out all the emails she sent me as a guide but I only tried a few. Oh well, all's not lost because my sister lives there now so there would definitely be more chances for me in the coming months/years when I come back to visit. 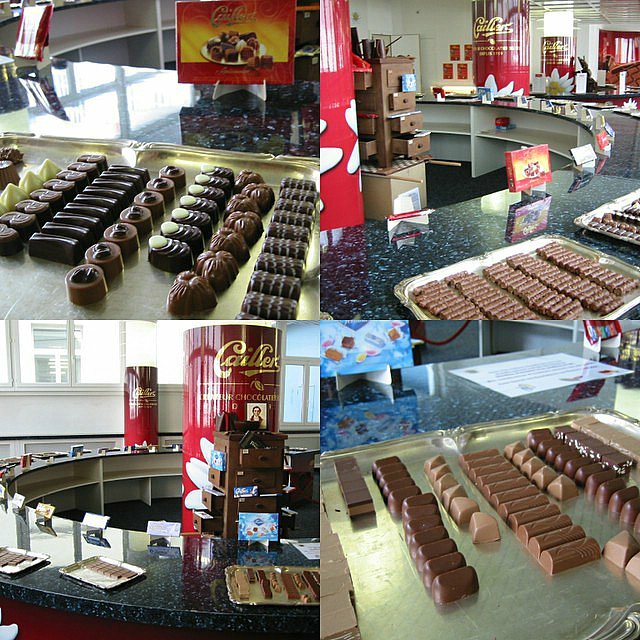 One of the highlights of our trip was a visit at the Nestle Cailler chocolate factory in Broc. We were shown a 'romantic' documentary on how the company was formed. Then led by a guide on sections of the factory while explaining the intricancies of chocolate making. Did you know that Cailler made the first milk chocolate? 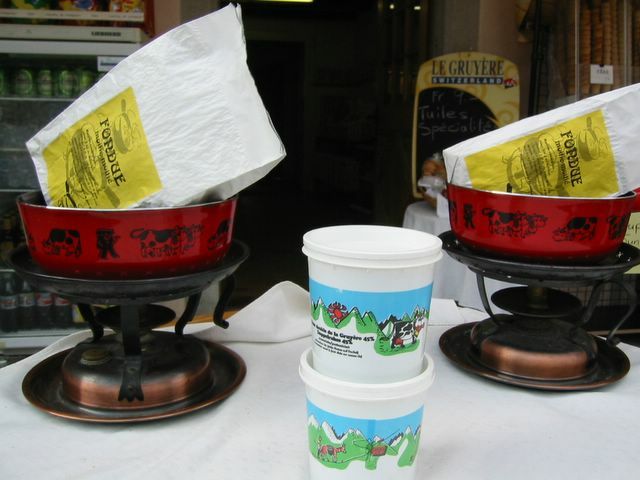 The lady guide said they only use fresh milk from the Gruyere area and are used in the factory within 24 hours of milking from cows. Unlike some chocolate makers who use powdered milk. It is the only Nestle Cailler factory and they only export 40% of their output which explains why their products are not very common outside of Switz. After the short tour we were led to the tasting room where an array of the complete range of Cailler chocolates were laid out for us to sample. Yes you can eat as much as you like!! I got really excited over seeing chocolates everywhere. Yum! See picture above of what we had. 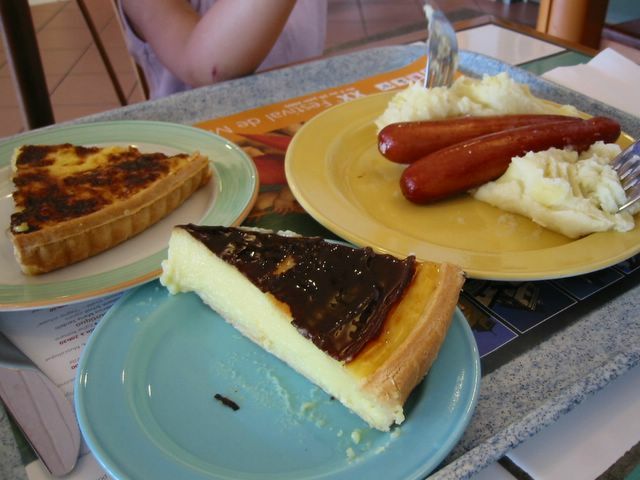 Most of the time we ate in fastfoods and Migros supermarket - they're the most affordable. Occassionally we indulge in some really rich snacks and desserts. 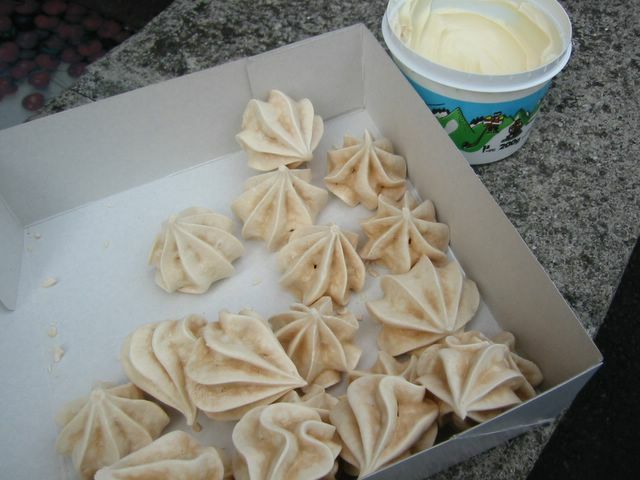 Above are meringues (or what's left of it) and heavy cream from the small cute village of Gruyere. Shoplady said to eat it by dipping the meringues in the cream and scoffing it down. Double cholesterolic calorific expialidocious !! But they were divine! Haha. I just forgot all about diet or high sugar level that day. The one time we went to a proper restaurant was at the Restaurant du Lac de Bret. Setting of the place was beautiful. We sat by a picture window overlooking the small picturesque lake of Lac de Bret. Seafood was their specialty so it was just natural to order that. 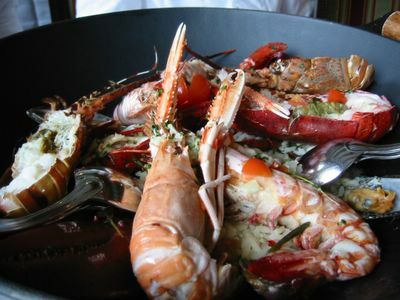 It was so fresh that we didn't realise the lobster in the aquarium that greeted us was our dinner! Poor chap but he was delectable. I couldn't remember the name of the dish we had but as you can see above it was served in a cast iron wok. The seafood (lobster, giant prawns, mussels, and langoustine) was steamed/cooked over long grained rice which was in turn cooked in stock and spices. The flavouring was simple and subtle which was meant to bring out the delicious freshness of the seafood. It was very very good ! Don't ask about the price though I don't want to spoil the memory. 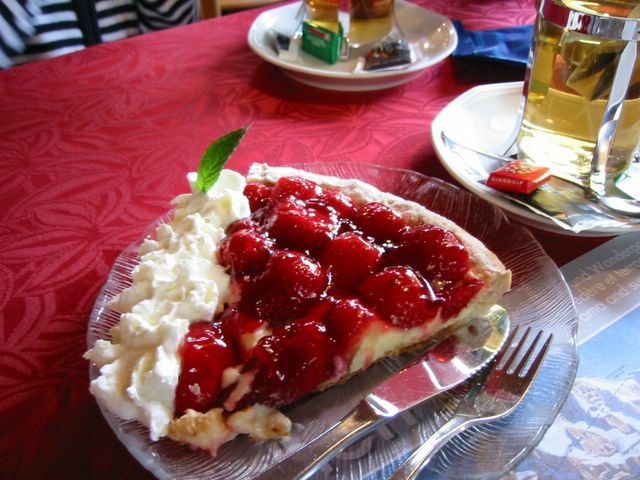 We visited the small delightful village of Kandersteg and had a happy 'accident' of being in a small brasserie-like restaurant (Aux Chalet View) where we had nice soups, delish strawberry tart (above), and the traditional Swiss rosti with bratwurst (below). First daughter liked the latter. 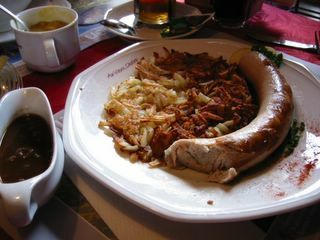 She said rosti was like hash brown while the sausage (bratwurst) was excellent. It's probably their proximity to Germany why all the sausages we had in Switz, whether from a street stall or a supermarket or a restaurant, were all superb. I didn't fare well foodie wise, why I didn't even get the chance to taste Swiss wine. A friend said they have excellent 'young' wines which are best to have within a year of bottling as they don't keep well through the years. Never mind I'll make sure my next time will be better.